Calculate the Reynolds number for an object moving through a fluid. Explain whether the Reynolds number indicates laminar or turbulent flow. Describe the conditions under which an object has a terminal speed. where is a characteristic length of the object (a sphere’s diameter, for example), the fluid density, its viscosity, and the object’s speed in the fluid. If is less than about 1, flow around the object can be laminar, particularly if the object has a smooth shape. The transition to turbulent flow occurs for between 1 and about 10, depending on surface roughness and so on. Depending on the surface, there can be a turbulent wake behind the object with some laminar flow over its surface. For an between 10 and the flow may be either laminar or turbulent and may oscillate between the two. For greater than about the flow is entirely turbulent, even at the surface of the object. (See Figure 1.) Laminar flow occurs mostly when the objects in the fluid are small, such as raindrops, pollen, and blood cells in plasma. Example 1: Does a Ball Have a Turbulent Wake? Calculate the Reynolds number for a ball with a 7.40-cm diameter thrown at 40.0 m/s. We can use to calculate since all values in it are either given or can be found in tables of density and viscosity. Figure 1. 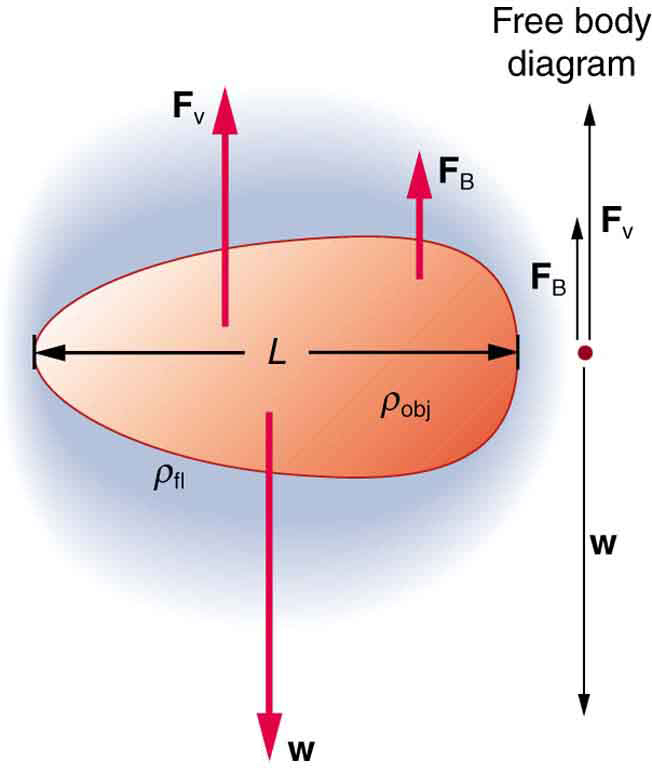 (a) Motion of this sphere to the right is equivalent to fluid flow to the left. Here the flow is laminar with N′R less than 1. There is a force, called viscous drag FV, to the left on the ball due to the fluid’s viscosity. (b) At a higher speed, the flow becomes partially turbulent, creating a wake starting where the flow lines separate from the surface. Pressure in the wake is less than in front of the sphere, because fluid speed is less, creating a net force to the left F′V that is significantly greater than for laminar flow. Here N′R is greater than 10. (c) At much higher speeds, where N′R is greater than 106, flow becomes turbulent everywhere on the surface and behind the sphere. Drag increases dramatically. An interesting consequence of the increase in with speed is that an object falling through a fluid will not continue to accelerate indefinitely (as it would if we neglect air resistance, for example). Instead, viscous drag increases, slowing acceleration, until a critical speed, called the terminal speed, is reached and the acceleration of the object becomes zero. Once this happens, the object continues to fall at constant speed (the terminal speed). This is the case for particles of sand falling in the ocean, cells falling in a centrifuge, and sky divers falling through the air. Figure 2 shows some of the factors that affect terminal speed. There is a viscous drag on the object that depends on the viscosity of the fluid and the size of the object. But there is also a buoyant force that depends on the density of the object relative to the fluid. Terminal speed will be greatest for low-viscosity fluids and objects with high densities and small sizes. Thus a skydiver falls more slowly with outspread limbs than when they are in a pike position—head first with hands at their side and legs together. By measuring the terminal speed of a slowly moving sphere in a viscous fluid, one can find the viscosity of that fluid (at that temperature). It can be difficult to find small ball bearings around the house, but a small marble will do. Gather two or three fluids (syrup, motor oil, honey, olive oil, etc.) and a thick, tall clear glass or vase. Drop the marble into the center of the fluid and time its fall (after letting it drop a little to reach its terminal speed). Compare your values for the terminal speed and see if they are inversely proportional to the viscosities as listed in Table 1. Does it make a difference if the marble is dropped near the side of the glass? Knowledge of terminal speed is useful for estimating sedimentation rates of small particles. We know from watching mud settle out of dirty water that sedimentation is usually a slow process. Centrifuges are used to speed sedimentation by creating accelerated frames in which gravitational acceleration is replaced by centripetal acceleration, which can be much greater, increasing the terminal speed.. Figure 2. There are three forces acting on an object falling through a viscous fluid: its weight w, the viscous drag FV, and the buoyant force FB. When an object moves in a fluid, there is a different form of the Reynolds number which indicates whether flow is laminar or turbulent. For less than about one, flow is laminar. For greater than flow is entirely turbulent. 1: What direction will a helium balloon move inside a car that is slowing down—toward the front or back? Explain your answer. 2: Will identical raindrops fall more rapidly in air or air, neglecting any differences in air density? Explain your answer. 3: If you took two marbles of different sizes, what would you expect to observe about the relative magnitudes of their terminal velocities? 12.6 Motion of an Object in a Viscous Fluid by OpenStax is licensed under a Creative Commons Attribution 4.0 International License, except where otherwise noted.